Jeremy Bulloch, in comparison to his most famous role, is a gentle-mannered man in his sixties with grey hair and a soft voice. He is a mild man who has a natural way with both adult fans and children. Bulloch came to Kansas City, the heartland, as a guest of honor at Planet Comicon, a science-fiction convention filled with Star Wars merchandise and costumed fans, and here, he kindly agreed to talk with me about his most famous role; a part that began with only four lines. Say the name, Boba Fett, to any Star Wars fan, and watch what happens. Eyes will open a little wider. Hearts will beat a little faster. This evil, silent and villainous character rivals Darth Vader in popularity. In fact, in 2003, a rocket-firing Boba Fett Action Figure sold for $16,000. 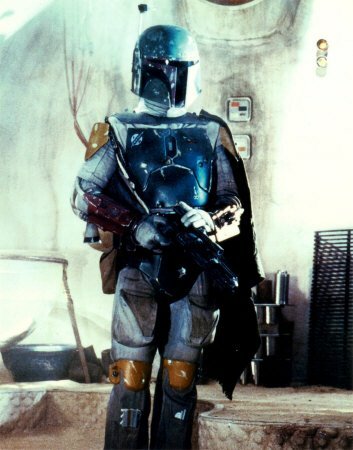 Boba Fett, the silent bounty hunter who tracks Han Solo to Cloud City, is a character shrouded in mystery, and despite an anticlimactic death in Return of the Jedi, is one of the most beloved villains in the series. So how was such a fearsome rogue brought to life in The Empire Strikes Back and Return of the Jedi? What does the face behind the mask look like? U.J. Lessing: You started out in the 1960s, and you were in a film with Cliff Richard. Were you interested in music and film when you were a kid? Jeremy Bulloch: I started acting at the age of 12 and did several children�s films, and the musical (Summer Holliday) came up out of the blue. I�m not a singer, and I�m not a brilliant dancer. But this was a fun musical, which they show every Easter, every Christmas. Time and time again I look at it and think, �Ooh, I got away with that bit of dancing.� I love music, film, and theatre. Everything to do with the profession is fantastic. UL: Before Star Wars, you also did a couple of "Doctor Who" episodes. Jon Pertwee was completely different. Just giggling like a schoolgirl all the time and just having a wonderful time. He was a delight. UL: And that episode you are in, �The Time Warrior.� It�s so memorable. It�s a great one. JB. Funny enough, there was talk that I would get on the...go into the Tardis, and go off, because it was the first one with Elizabeth Sladen as the companion. And there was talk that I was going to get on the Tardis and go away with them, as they were writing it. So it�s a bit sad. It would have been nice to do a few more episodes. UL: What were the exact events that happened that brought you to Boba Fett? JB: The events were that they were auditioning, well to me it felt like, extras really. The bounty hunters were all characters standing around, and I was told, I got dressed in the outfit, and I fitted the outfit. I saw Gary Kurtz and George Lucas came in and said, �Yeah, uh-huh, okay. That�s fine. Uh-huh. Uh-huh.� And I just fitted the costume. I didn�t have to read. I didn�t realize�I didn�t know how many lines there were, and when I realized there were four, oh well. Never mind. And it is actually the smallest part I�ve ever played. Four lines. But, isn�t it funny? I�m known all over the world for that part covering my face. And I think I was very lucky that I was there on the right day, the right time, and the audition was, �Well, welcome aboard, Jeremy.� I fitted the costume. There was no reading. There was no, �I�m not sure whether you look right. Come back again.� There�s no screen test. It was as simple as that. I always believe that most people could do it. I mean obviously I didn�t just sit and stand. I used to love cradling the gun and just posing with the hand cocked ready to fire the gun, and the costume helped a great deal. UL: In The Empire Strikes Back, you have this bounty hunter that�s more of a Raymond Chandler character than a George Lucas character. Do you think that Leigh Brackett had a lot to do with the development of Boba Fett? JB. Yes, I think so. Yes. I would absolutely agree with you there. Originally, funny enough, the costume was, he was a super trooper. It was sort of a whitey grey full costume. And I think George Lucas came in to say, �No. We need to doctor it up a bit,� and it became a green outfit. So originally he was a shock-trooper. The outfit was based on a series of shock-troopers, which you actually never saw in the film. UL: Many of Boba Fett�s fans were disappointed by his death in The Return of the Jedi. How do you feel about that? JB. Well, I agree. I was rather upset as well, but I mean, that�s filming, you know. He got rid of Boba Fett, but in a way it helps the whole story thing because stories are invented. He gets out of the pit. This happens and that. From my own point of view, I was a bit upset. It would have been nice to have had a little bit longer time in that sequence. I just thought he went a little bit too early. UL: Especially since Lucas expanded the whole mythos of Boba Fett in the second film. Did you enjoy watching Attack of the CIones and seeing the history and the background of Boba Fett? JB: Yeah, I think what�s so nice having met Temuera Morrison (Jango Fett) and Daniel Logan (young Boba Fett), it�s nice that he has a background. It�s quite possible that you know you just never hear of him again, but he�s in Attack of the Clones, and you see him. He�s a clone. I�ve had to undo all the things I�ve said about Boba Fett. I said he was a human being. Well, now he�s a clone. They said, �Why did you say he was a human being?� I said, �Well, he is. You know. To me,� but now he�s a clone, so it�s all new. UL: You are appearing in the new Star Wars film opening in theaters this summer in a cameo I believe. JB: Yeah. There is a cameo. I haven�t talked about it much, because you can be filming for two weeks, and when you see the final piece you can end up being cut out of it. There�s always that possibility. I hope I�m in it. It�s only a brief cameo. So I suppose it�s a tribute to the amount of work I did in the films. I love doing this day, and George was exactly as he�s always been, very calm and very gentle, and if I�m in the final cut in the summer theater, I�ll be thrilled. If I�m not, well that�s the way things go. I might end up on a DVD Special Edition Cut version of where was Jeremy Bulloch in this scene, or can you spot Jeremy Bulloch in this scene? But hopefully I�ll be in the final piece. UL: Do you have other future acting projects? JB: Well, I just finished a six episode comedy series called �Star Hyke.� It�ll be shown in the autumn somewhere in England, but we still don�t know. A lot of special effects to be slotted together, so we�ll just see what happens with that. Other projects later this year, but I think it�s going to be a very very busy year this year with Star Wars and the re-release, so I�m sort of running about going backwards and forwards to America, Japan, Mexico. So there will be a lot of things to do.